For the first time, heavy water (D2O) - a form of water containing deuterium (D) instead of hydrogen) - was used in the field of transmission electron microscopy (TEM). This latest method considerably delays the damage caused to a sample; sample damage considerably limits the wider application of liquid-phase TEM to delicate biological samples. As life is predominately based on water, our molecules are vibrating, moving, and flipping in a liquid environment. However, electron microscopy, which is known to be an excellent instrument for studying a static model of the nanoworld, has been practically difficult to use when it came to viewing the moving molecules. This is because the samples are damaged by the incident electron beam. Now, researchers at the Center for Soft and Living Matter, within the Institute for Basic Science (IBS), have reported a major advancement in this aspect. Published in ACS Nano, the study is the first to use D2O in the field of TEM. This method considerably delays sample damage. In electron microscopy, electrons that are shot against the sample possess a much shorter wavelength when compared to light, and as a result they are more suitable for providing data about single molecules. The electron beam, on the other hand, is aggressively strong and may damage the specimen owing to its high energy, which breaks the chemical bonds and produces an electric charge. 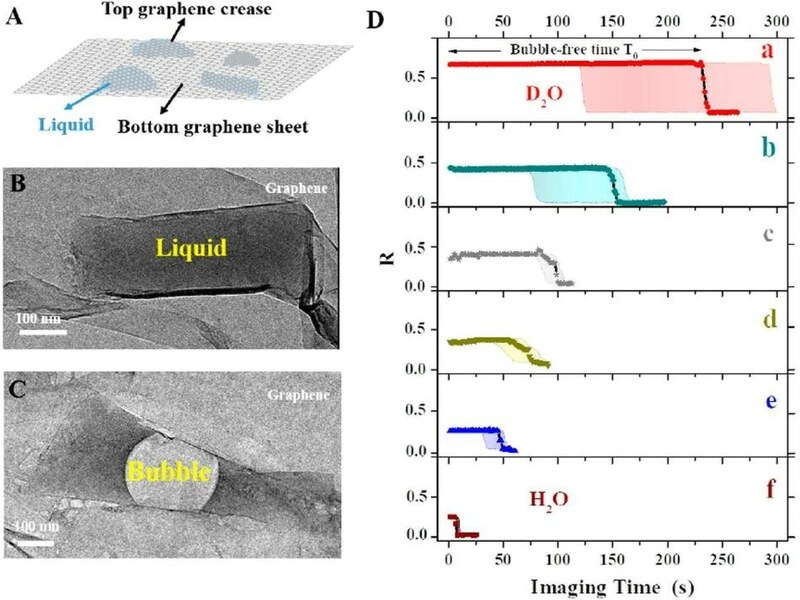 IBS team utilized a very small pocket filled with liquid packed between atomically-thin sheets of graphene. Within this graphene, the sample molecules move freely and are protected against electrical charging. The researchers tested different types of liquids to spot the one that maintains the sample for a longer time. “In contrast to the common approach of reducing the energy of the electron beam to delay sample damage, we focused on tuning the environment; the water in which the molecules of interest are dissolved,” says co-author of the study Huan Wang. IBS researchers have demonstrated that when heavy water is used, it provides a number of benefits over other competing techniques. D2O not only delays the formation of gas bubbles most effectively, but also delays the structural damage of individual polymer molecules. Moreover, D2O has one more neutron when compared to H2O, which means that it is heavier and hence more hard to dissociate into radicals, and also less reactive in the ensuing damaging process. D2O is also a harmless sunscreen, which is another vital advantage. The sample, which was a polymer of polystyrene sulfonate, displayed the same pattern of dynamics and analogous contrast in water and in D2O. In the future, we plan to extend this study to more complex macromolecules, like DNA and proteins. Moreover, the study opens avenues to observe long-term phenomena in other related microscopy techniques, like cryoEM (cryogenic electron microscopy), and to get more statistical information about complex phenomena, like self-assembly of single molecules into more complex biological structures.